Graduate of Athens National University, Medical School. Training in Diagnostic Radiology in the Department of Radiology of the University of Patras Medical School. Doctoral Thesis from the University of Patras Medical School. Lecturer in Radiology at the Department of Radiology of University of Patras Medical School. Assistant Professor of Radiology at the Department of Radiology of the University of Crete Medical School. He worked as a research fellow and got a Doctoral Thesis from the University of Patras Medical School. He was elected as a Lecturer in Radiology at the Department of Radiology of University of Patras Medical School. Then he moved to Heraklion, Crete where he was elected as an Assistant Professor of Radiology at the Department of Radiology of the University of Crete Medical School. In 2009 he has moved in Hygeia Group where he works up to now as Head of the Department of Diagnostic Radiology of Hygeia and Mitera Hospitals in Athens. He is regularly invited as a speaker in national and international scientific meetings. During his academic terms in Patras and Heraklion his special interest and research was mainly in Abdominal and Urogenital Radiology. He was also in charge of the units of Diagnostic Ultrasound in the university hospitals of Patras and Heraklion. He attended intensive clinical fellowships on focal liver disease at the Glasgow Royal Infirmary in Scotland, UK and on Vascular Ultrasound at the Thomas Jefferson University, Department of Ultrasound in Philadelphia, PA, USA. 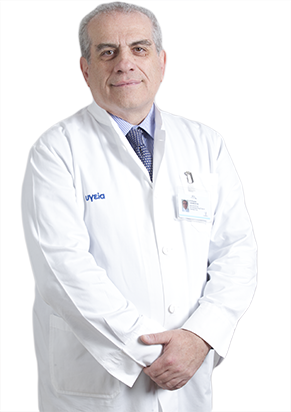 During his present term in Hygeia Group he collaborates with the Department of Diagnostic Ultrasound on the Sonoelastography of the Prostate. He has authored or co-authored forty scientific papers and three chapters in scientific books. Nicolau C, Claudon M, Derchi LE, Adam EJ, Nielsen MB, Mostbeck G, Owens CM, Nyhsen C, Yarmenitis S. Imaging patients with renal colic-consider ultrasound first. Insights Imaging. 2015 Aug;6(4):441-7. doi: 10.1007/s13244-015-0396-y. Epub 2015 May 21. PubMed PMID: 25994497; PubMed Central PMCID: PMC4519809. 22696042; PubMed Central PMCID: PMC3314732. Detorakis ET, Drakonaki EE, Tsilimbaris MK, Pallikaris IG, Giarmenitis S. Real-time ultrasound elastographic imaging of ocular and periocular tissues: a feasibility study. Ophthalmic Surg Lasers Imaging. 2010 Jan-Feb;41(1):135-41. doi: 10.3928/15428877-20091230-24. PubMed PMID: 20128584. Kornezos I, Chatziioannou A, Kokkonouzis I, Nebotakis P, Moschouris H, Yiarmenitis S, Mourikis D, Matsaidonis D. Findings and limitations of focused ultrasound as a possible screening test in stable adult patients with blunt abdominal trauma: a Greek study. Eur Radiol. 2010 Jan;20(1):234-8. doi: 10.1007/s00330-009-1516-1. Epub 2009 Aug 7. PubMed PMID: 19662419. Papanikolaou N, Gourtsoyianni S, Yarmenitis S, Maris T, Gourtsoyiannis N. Comparison between two-point and four-point methods for quantification of apparent diffusion coefficient of normal liver parenchyma and focal lesions. Value of normalization with spleen. Eur J Radiol. 2010 Feb;73(2):305-9. doi: 10.1016/j.ejrad.2008.10.023. Epub 2008 Dec 16. PubMed PMID: 19091503.
meta-analysis. Eur J Radiol. 2010 Feb;73(2):334-8. doi: 10.1016/j.ejrad.2008.10.026. Epub 2008 Dec 6. Review. PubMed PMID: 19058939. Gourtsoyianni S, Papanikolaou N, Yarmenitis S, Maris T, Karantanas A, Gourtsoyiannis N. Respiratory gated diffusion-weighted imaging of the liver: value of apparent diffusion coefficient measurements in the differentiation between most commonly encountered benign and malignant focal liver lesions. Eur Radiol. 2008 Mar;18(3):486-92. Epub 2007 Nov 10. PubMed PMID: 17994317. Yarmenitis SD, Karantanas A, Bakantaki A, Papantoniou Y, Gourtsoyiannis N. Detection of colorectal cancer hepatic metastases with contrast-enhanced ultrasound: comparison with conventional B-mode ultrasound. Dig Dis. 2007;25(1):86-93. PubMed PMID: 17384513. Karantanas AH, Yarmenitis S, Papanikolaou N, Gourtsoyiannis N. Preoperative imaging staging of rectal cancer. Dig Dis. 2007;25(1):20-32. Review. PubMed PMID: 17384505. Skalidis EI, Zacharis EA, Tsetis DK, Pagonidis K, Chlouverakis G, Yarmenitis S, Hamilos M, Manios EG, Vardas PE. Endothelial cell function during atrial fibrillation and after restoration of sinus rhythm. Am J Cardiol. 2007 May 1;99(9):1258-62. Epub 2007 Mar 13. PubMed PMID: 17478154.